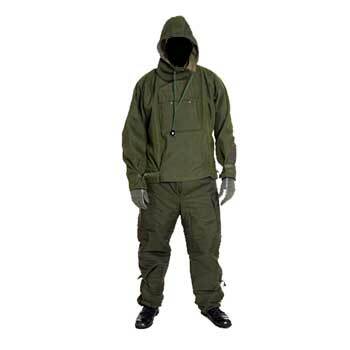 This is the Nato MKIII Chemical Jacket. It is fully charcoal lined. This jacket completely locks in your human scent as well as keeping any chemical substances away from you. This smock has velcro cinches at the wrist cuffs and waist to make this an easy fit. This smock has a hood and comes packed in a vacuum sealed, air tight, poly bag. This chemical jacket is available in size Medium. The color of these chem jackets is OD green. Not for sale outside the U.S.